The Mass Effect saga is a sprawling epic that covers over a hundred thousand years of galactic history. In Bioware’s extensive fiction, we learn about people long extinct, meet dozens of new races, and come together to fight an enemy that threatens to destroy it all. It’s a complex timeline filled with personal conflict, social turmoil and galactic politics. And we got our first glimpse of it in Mass Effect: Revelation. 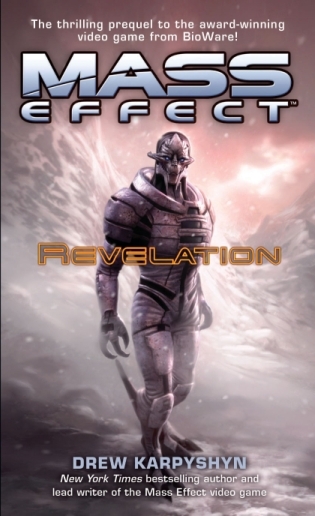 Released before Mass Effect dropped on the XBox 360, Revelations takes place some years prior to Commander Shedpard’s adventure and introduces many of the key characters and events that not only affected the main trilogy’s story but the universe as a whole. That makes a lot of sense: Drew Karpshyn was the main scenario writer for Mass Effect and one of the creative forces behind the entire fiction. The novel starts with an SOS from an Alliance base. David Anderson is sent to the planet Sidon to investigate. What he finds is the burned-out husk of a secret military project that could could threaten humanities place among the species of the galactic council. By the end, we’ll meet Kahlee Sanders, sole survivor of the attack and wanted for its destruction, and Saren, the merciless Spectre agent looking for ‘justice’. The story is told simply and directly and moves briskly through itself with a logical flow and easily understandable goals. While there are some nice action scenes and intrigue, the story never hooks with a strong sense of urgency; none of the events feel important so nothing is really exciting. The characters are well-defined but few are truly interesting. This comes mostly from the necessity of their roles in the story: Anderson has a job to do and Kahlee needs to clear her name- those are setups that have very limited avenues for characterization. Saren is easily the most engaging; Anderson’s dark reflection who will do anything to enact the Council’s. As someone who has completed Mass Effect more times than is reasonable, that information does a great job filling in the past of characters important to Mass Effect. But that itself is unfortunate because it makes you realize how one-dimensional Saren was represented in that game. It’s a worthwhile read if you care about the universe and want a better understanding of the events that shaped an entire narrative.